MR Series Single Shaft Shredder are heavy duty single-shaft shredders featuring a push drawer. The MR Series Shredder is designed to shred heavy duty materials at a high volume including plastic blocks and sheets, polymer pipes, extruded sheets, medical plastic waste, electric cable, and rubber waste. This shredder features a hydraulic control for the pusher drawer to drive the material towards the blades for shredding. 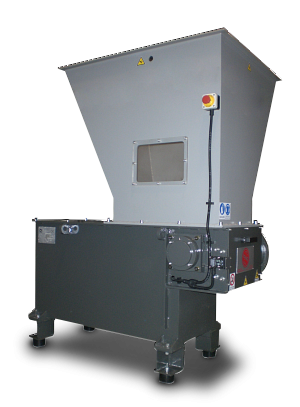 The MR Series Shredder can be used in-line for continuous shredding.